The Lenovo Yoga c930 comes the closest so far for a product that could truly cause users to leave their tablet behind. Intel really screwed up the notebook market by launching the 2-in-1 concept of products none of which were truly 2-in-1s. You see, we knew going in that laptop users struggled with screens under 13” and tablet users wouldn’t carry tablets much over a single pound…or that had screens much larger than 10”. The Intel 2-in-1s were both too heavy and too large to be used as tablets – and yet their marketing had people asking for them (and OEMs building them). The vast majority of users, however, never used the tablet. This would be like car companies convincing everyone they needed a convertible in Alaska where no one would ever dream of putting the damn top down. It was fascinating to watch the entire market shift to what was an interesting idea very badly executed. Given users were struggling with replacing their laptops anyway, this likely didn’t help overall market growth much. Three products stand out as aggressively trying to create a true 2-in-1: The Apple iPad Pro, the Microsoft Surface Go and the recently announced Lenovo Yoga Book c930. [Disclosure: both Microsoft and Lenovo are clients of the author.] I’ve written about the Surface Go before, posing the idea that the perfect blend might just be a Surface Go and an Amazon Fire HD 10. The Lenovo Yoga Book x930 may actually provide a better alternative without the Amazon tablet. Let me explain. This is Lenovo’s second run at what is a very unique product class: A small 10” class notebook that is truly small and light enough to be a tablet. The first attempt had an innovative flat keyboard that could also function as a digitizer. It was interesting, and I did carry it for a while, but like the Surface Go I found its tablet capability lacking (mostly due to apps). And the keyboard, while interesting, wasn’t useful enough to give up a regular laptop. The new Yoga Book c930 replaces that keyboard with a second ePaper screen that can also function as a keyboard. ePaper as Amazon has demonstrated with their Kindle line is a preferred medium for reading and uses a fraction of the power that an LCD, or particularly OLED panel will use. The result is you get a laptop/tablet/reader product that has functionality, that on paper, replaces all three products. Now there remains the issue with apps with the biggest problem for me being the implementation of the Kindle app on Windows. However, I believe that the recent partnership between Amazon and Microsoft to allow Alexa and Cortana on both firms’ products should result in Amazon improving their app support on Windows shortly which would allow me to leave both my Kindle and my Fire HD 10 tablets at home. One other interesting feature is a smart metal latch on the product that you knock to open. This is very reminiscent of the old Dell (disclosure Dell is a client of the author) XPS Adamo laptop which also used smart metal for a latch. You knock twice on the laptop cover and it pops open which is a ton better than some laptops which seem to be far more of a challenge to open then they need to be. The only discord with both the Surface Go and this Yoga Book is that instead of using the better suited (for something this thin and light) ARM solution that Microsoft places in the “Always Connected PC” category both use Intel processors which aren’t ideal for this form factor. Battery life and connectivity are likely more important than performance with something in the tablet class these credibly occupy. Lenovo did also launch the Yoga C630 which uses this always connected platform, but it is more of a traditional Intel 2-in-1 configuration. I expect both the Microsoft and Lenovo solutions will eventually migrate to ARM likely with the next release of Snapdragon that targets this class of product. When something isn’t working you don’t just keep pounding on the same designs and ideas, you try something new and both Lenovo and Microsoft are doing that with their respective offerings. 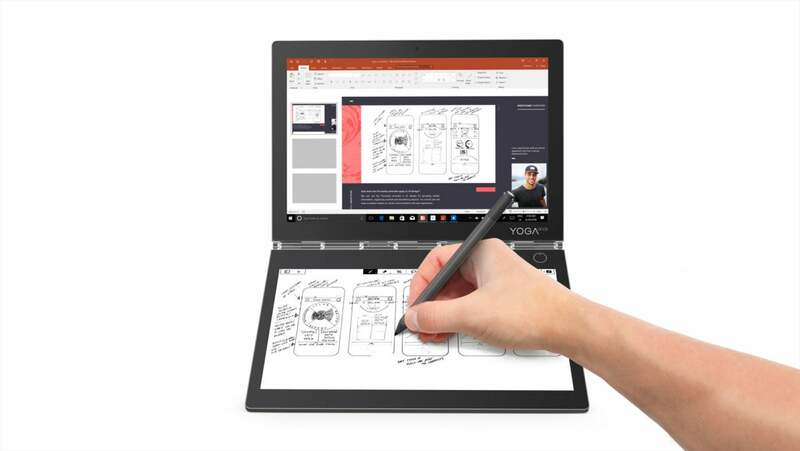 The Lenovo Yoga c930 comes the closest so far for a product that could truly cause users to leave their tablet behind and use this in both tablet and laptop mode successfully. This is largely thanks to the implementation of ePaper which creates an advantage that an iPad or Fire HD 10 tablet don’t have, a better book reader on top of the improved tablet functionality. Like the Surface Go, a home run still waits for better tablet app support (and likely a Snapdragon rather than Intel processor) but, I expect, that at least an improved Amazon Prime and Kindle reader experience is coming so, for now, this is arguably the best true 2-in-1 in the market. Now the question for you is – do you really want a 2-in-1?